Now a days everyone are doing jobs right. Do you know What is Employee Evaluation ? Why Employer monitoring is carried out ? What is Employee Monitoring? As you know employees plays a major role in the growth of the organization there are certain ways like employee monitoring and employee evaluation can be done for the growth of organization and as well as the employee. Every organization has employees who work for day and night. The organizations have various work policies, metrics and system to ensure that they are compensated in the best possible means. The success of these systems is often based on employee monitoring and evaluation. Employee Monitoring can simply be defined as a routine and systematic collection of information based on work of an employee. These could be related to performance, outcomes, motivation level, strategies, similar strands and Number of hours worked in a week. 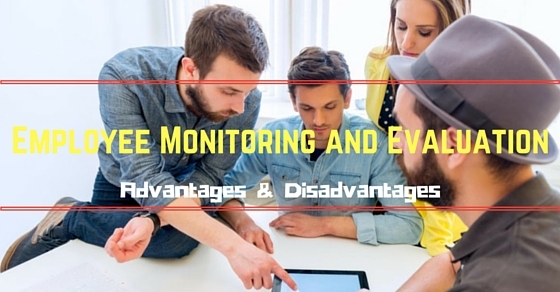 Whenever any organization is looking out for making decisions regarding evaluation and monitoring there are many aspects that need to be looked into which finally influences the advantage or disadvantage of these processes. Here it becomes important to understand what these terms means in a business environment before analyzing the rest. It may sound that monitoring employees is done by organizations that do not have trust in the workforce and are always poking in the business. But there are times when setting monitoring equipment in a workplace benefits both employees and the organization. It is definitely advised that monitoring should not be done in a manner that it hampers the flexibility and the motivation level of the employees. Let us see a few benefits of monitoring the workforce which will help us understand the situation better. Monitoring should be done to know what is not working properly in an organization. There are times when a small error in the work or in the process eats up a lot of time when rectification is made. Simple monitoring of work here could change a lot of things. lt enables the organization to make necessary amendments in time without having to lose on work. This when done in the right manner is appreciated by employees. It so happens that employees in the situation of different type of work and extra handling find it difficult to monitor their work, they really appreciate when such mistakes are pointed out in the right manner. It benefits employees improve their work efficiency and they grow with their work. The other benefit is to the organization which realizes the small inefficiencies and do not have to bear losses when they become huge. Most of the time it is seen in every organization that most of the employees feels thankless for their work. This situation arises as the projects are a combined effort and any employee which has gone over and above his call of duty is not getting appreciated. Monitoring enables organizations to find these gems within the organization and appreciate and duly compensate them for their efforts. In this case, when monitoring is used for identifying performer, the problem and negative image of the monitoring system is washed off. The trust issue which is generally seen as the reason for monitoring is completely ruled out. Safety instructions and similar policies in any organization is designed by all organizations to make sure that everyone in the workplace is secure. There are times when employees in ignorance or just to save time skip out on following any one of them. This can create serious repercussions for them. This may even lead to grave situations for others who are not at fault. Monitoring the workplace ensures that such policies are followed strictly and every employee is making sure that they are safe and care for everyone around them as well. There are many employees who do not follow the company’s policy and there are others who feel that certain policies do not apply to them. When this happens companies suffer a lot, they are even bad influence on others. The culture of the company is adversely affected and thus should be addressed immediately. When employees are seen making these mistakes they should be immediately called out. There is no way any employee should ridicule the company’s policy. This ensures that a highly professional culture is built in an organization. Everything has a flip side and here the monitoring process is no different. It has various cons because of which organization goes through a difficult time deciding whether to implement it or not. The following points will bring to light how monitoring process can be disadvantageous to any organization. Monitoring the workplace is not an easy process, it is time consuming and costly. It can create unnecessary burden on the organization. The cost of installation and establishment of such monitoring system and process is not just a onetime cost. Continuous monitoring requires maintenance and processing cost that becomes difficult for organizations to bear. When such monitoring systems become a part of any organization, they feel that the organization does not trust them. This is stressful for them and leads to many misleading conclusions. Whenever any organization is undergoing the decision of including monitoring process it should be shared with the employees. There should be reasons to such changes and genuine ones. Even when it means that it is regarding quality of work, it should be shared so that employees take their work seriously and it has a positive effect on the work delivered. There are times when employees get frustrated being under surveillance all the time. They worry a lot of making mistakes and most of the time work under pressure. This kind of working atmosphere leads to reduction in productivity and employees do not feel secure about their jobs. The easy way to deal with this is to ensure employees that monitoring would not harm them in any negative way. It is seen that all organization has motivated employees who have better suggestions that can be used to make any organization work efficiently. These kind of new ideas and creativity is also hampered when employees are continuously under surveillance. This leads to loss of great opportunities which could have a result of a good brain storming session. The next step to monitor is to evaluate the employee’s performance as this monitoring provides a lot of data.Evaluation is a process of making judgments about the value of any component which was a part of the monitoring process. Evaluation also has strands and evaluation process in any organization is lengthy and demand transparency. The basis of evaluation is great but is this the only means and how beneficial is it for the organization? Employees work in every organization to be recognized. Most employees sees recognition more dear than various benefits provided by the organization. The evaluation process when chosen carefully by any organization can be the solid base on which employees who are performing well are duly recognized. The evaluation process allows identification of over performing, critical resources possible with ease. Employees when duly recognized tend to be more loyal to the organization and even take monitoring process positively and add to the strength of any organization. Reorganization is an important part of every employee and organizations goals and thus it is important that due efforts are taken in that direction. Every employee in an organization is interested in career development and personal development. This is possible only when their current performance is evaluated on desired stands and a process is designed. When the performance is evaluated on prior discussed stands and checked whether the goal is being achieved, it gives employees a good idea of what worked and what did not. This means that employees can now go back and rectify or identify any errors where they need to work. It also works as a solid platform on which any discussion can be based especially discussions related to appraisals and promotions. Evaluation clearly shows what strengths have been demonstrated, what goals have been achieved and where there is still need for improvement. Employees in every organization need motivation from the staff from time to time to reach their goals. Evaluation process when discussed with the employees can serve as a motivational platform. When employees are aware how they are going to be evaluated, what are the areas they need to work on and how the organization sees them, they are motivated to perform well on them. It is always best interest that evaluation process is fair and discussed with the employees, their suggestions can also be taken so that they feel a part of the process and they will definitely work towards it. It is advised that evaluation plans and process are discussed with employees in the starting as opposed to it being a surprise for them. Though there are no disadvantages of this process but incorrect application of the process will be a problem. When the evaluation process is inculcated without proper research or planning it may be harmful. What it can lead to is displayed here. More often employees are seen becoming prey to evaluators bias. This means that the one evaluating the employees does not use fair means and judges the employees on personal level. This disturbs the whole system and creates trust issues amongst employees. The system is definitely designed to be fair and transparent but let’s face it, it is ultimately run by people who have personal biases. This is seen to yield negative outcomes and lack of employee motivation. The whole purpose is lost and most of the time it is seen that employees turn against the whole system because of the evaluator who has been wrong in conducting the evaluation. When it is discussed with the employees creates a complacent atmosphere. When they know that they are being evaluated on strands that are their strengths, they stop making efforts to grow. Most of the time this leads to lack of new ideas and proactive behavior. Employees are often seen working only on the points they will be evaluated at and make no extra effort. A simple fix to this situation could be open ended strands and perks for next level performance. When employees see that their extra work will be recognized, they will definitely work on that. This will create a good balance as well, the employees who perform well at given task will be evaluated and appreciated and other who are next level employees will also be identified and a clear distinction can also be made. Thus, this disadvantage can be carefully handled. Evaluation process is designed in a way that it brings out the best in people. It is for people to sit together and discus what worked and where there is scope of improvement. Sometimes it so happens that these kind of meetings do not turn in a discussions and are left at a monologue level where the superior shares the reports and generally the subordinate sits quiet and listen. This does not solve the purpose of the meeting. It is also seen that after some time these new way of one sided conversation is accepted as the only way of such meetings and the discussions never happen. This is never in the best interest. A simple way to solve this issue is to promote conversations and motivate employees to make it as interactive as possible. Most important argument here would be what kind of evaluation process is chosen what monitoring methods are used and how it is communicated to the employees. There are so many benefits of monitoring and evaluation of employees.The success or failure of monitoring and evaluation process will revolve around the research that the organization will come up with. If the research is done well then there are less chances of any disadvantages coming up. Monitoring and evaluation are integral part of any organization as it leads to employee development, growth of the organization and well documented ways of things. It is thus always advised to choose it fairly and keep it transparent to ensure success.